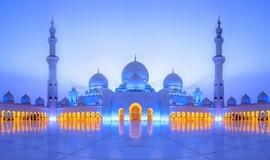 Abu Dhabi | Popular Destinations & Cities in U.A.E. 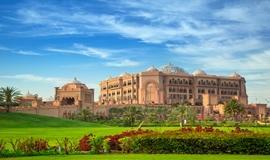 Abu Dhabi in Arabic means "Land of the Gazelle". According to legend, the city was founded when a young antelope led a nomadic people to fresh water, on an island with just 300 palm huts (Barasti), some coral constructions and the fortress of the ruler. 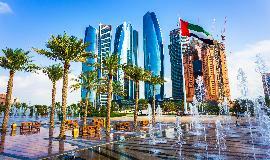 Since then, the simple settlement has radically changed and developed into the modern, cosmopolitan city of Abu Dhabi, the skyscraper capital of the United Arab Emirates. Learn more about the religion and traditions of Abu Dhabi, best by visiting one of the most impressive landmarks of the city, the stunning Sheikh Zayed Mosque. It is an architectural wonder that offers space for 40,000 faithfuls, with 80 domes, over 1,000 columns, gilded chandeliers and the largest hand-woven carpet in the world. Do not miss out on our famous Corniche: stroll along the impressive eight-kilometer promenade, which features a playground, separate footpaths and cycle paths, cafes, restaurants and Corniche Beach, a supervised beach park. Beach lovers should also have some time for the public beaches of the islands Saadiyat and Yas. For a touch of luxury, you can also spend a day at the super luxury Monte Carlo Beach Club on Saadiyat. In Abu Dhabi, you should definitely dare to go on the water. Whether wakeboarding, surfing or parasailing, boat trips in traditional pearl dive boats or kayaking through the natural mangrove forest, fast boat trips or dives, cruises, snorkeling or swimming; The waters of the Emirate are yours!